I had a chance to spend time with my Great Uncle this past week and had another opportunity to see what a life sold out for Jesus looks like. He is 94 years old and still on fire for God! He told me some new stories I haven’t heard before, about many of the revivals he led, different churches he planted, and even about a time where the power of God hit him so hard that someone else had to preach for him—and he laid on the platform during the entire service! One thing he reminded me about was the importance of following Holy Spirit. Jesus taught about the importance of Holy Spirit, about how he would will lead us into all truth, and even show us the future (John 16:13). When we follow closely after Holy Spirit, we are sure to run into truths we have not yet discovered and catch glimpses of what God has planned for us a little further down the road. Our society today has advanced to the point where we can find a lot of the answers we need, or we think we need, by reading a book, taking a test, or putting some type of process in place. Some of these methods work, but they are often substitutes for what Holy Spirit can teach us, if we are simply willing to listen to him. We often teach on the importance of developing such a deep intimacy with our creator, that we are able to hear his voice in any situation and follow the path of his footsteps wherever he leads us. It’s not always a quick fix. Sometimes it’s a journey that leads us to a place that we could have never reached using any other method. It’s not always easy, and sometimes we look a little foolish, especially when those around us don’t understand this simple principle. But one thing I have learned is that there is no one better to follow. Even if I don’t understand where he is leading me, or how long it will take to get there, I will follow him anywhere. That’s the life we are all called to live. There really is no better guide who can not only get us through life, but can do it in a way that enables us to fulfill every purpose and destiny for which we were created. If you are trying to figure out your next steps, if you are going through a season of difficulty, or even if you are in a great place right now, ask Holy Spirit to guide you, and get ready for the greatest adventure of your life! We started a reading plan this year with the goal of reading through the entire Bible in chronological order in 90 days. You tend to notice the thread of God’s grace a lot easier when you read at this pace, and you tend to recognize one common theme throughout the Old and New Testaments which is pretty simple and straightforward: do what God tells you to do and everything will be OK. Actually, better than OK, God promises that we will be blessed when we are obedient. It’s amazing what God will do in our lives if we simply choose to live according to his word, and not allow anything apart from his word to have an influence in our lives. It almost seems too simple. But the reality is that the gospel of Jesus is very simple. We tend to complicate it, but it really just comes down to following our King wherever he leads us, and that can be through the written word of God, through the Holy Spirit’s leading, through messages delivered by angels, or even through hearing God’s audible voice. I have found that when we give his word precedence in our lives, he speaks to us in amazing ways. The problem, of course, is that there are so many other competing voices that want to have influence in our lives. We all tend to look for the quick fix or the quick answer, especially in this fast food age where everything we need is at our fingertips all the time. But Jesus wants us to do something different. He wants us to sit at his feet. He wants to keep it simple. He wants us to focus on the guidance and direction that he gives. And a great place to start is by reading and studying the written word of God, and applying each of his principles to our lives. A verse in Galatians 6:14 jumped out at me a few days ago; “The world is crucified to me, and I to the world.” I have come to the point that I really don’t care what the world has to offer. It used to interest me, but not anymore. I just want more of Jesus, so I can have an even greater impact in the lives of people I encounter every day. I remember someone telling me a long time ago about how the Bible could be thought of as this acronym: Basic Instructions Before Leaving Earth. Simple instructions, but a powerful message. And when we apply it to our lives, we are able to live in a way that honors the sacrifice of Jesus. By the way, if you are interested in our Bible reading plan, you can find it on our resources page here. If we look back at our childhood and teenage years, from the perspective of an adult, we can quickly recognize how much maturity we gained as we grew older. We can also recognize how the influence of others may have helped or stunted our maturity, or in many cases, how our youthful obstinate attitudes slowed the maturation process. We all seem to mature at different rates, and this is also true with spiritual maturation. Just like physical maturity gives us a greater understanding of how to make healthy choices and behave appropriately in society, spiritual maturity also helps us to do the same when it comes to spiritual choices and interaction within the spiritual realm. If we look back at our spiritual journey, many of us can recognize when we went through seasons of growth that increased our maturity in a way that enabled us to make adjustments to the way that we think, believe, and live. 1 Cor. 13:11 speaks to this reality, that as we mature, we need to put away childish perspectives. As children, we don’t understand why we need to behave in certain ways, but as we mature, we learn more about what appropriate behavior looks like. This is the same thing in the spiritual realm. As we mature, we learn to put away perspectives and practices that are not appropriate for the children of God to allow into our lives. We meet with people throughout each week, and often receive questions about healthy and unhealthy spiritual practices. 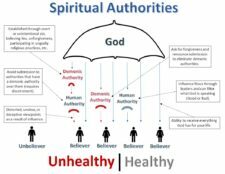 Spiritual maturity helps all of us to recognize unhealthy spiritual practices. But those who are not spiritually mature have a difficulty in understanding the wisdom of God, and just as we were as children, we have to grow to a mature state and avoid obstinate behaviors that can slow the spiritual maturation process. We all need to recognize that unhealthy spiritual practices can create ungodly spiritual influences in our lives. As we become more spiritually mature, we become more spiritually aware of the importance of this danger. Sadly, for many believers, it’s not until the later years of life where we begin to figure this out. Part of the reason for this is because, in the past few hundred years, the church has not served us well in teaching about the spiritual realm or the supernatural ways of God. As a result, many believers have pursued supernatural encounters through ungodly processes. Some of those processes are overt, such as fortune tellers, psychics, or Ouija boards. Others are quite covert because they have non-Christian spiritual roots that are not immediately obvious to the spiritually immature. Some examples here are Yoga, Enneagram, Mindfulness, and Reiki; all of which are rooted in Hinduism, Buddhism, and other mystical beliefs that are anti-biblical. These fall into the category of the “childish things” we see mentioned in 1 Cor. 13:11 because they are actions born out of an immature spiritual state. And they are dangerous practices because all non-Christian religious practices are influenced by demonic spirits, who are seeking to create ungodly influences in our lives. Another question we often receive in this realm is about why some Christian leaders support the notion that these other religious practices are perfectly fine to participate in and even teach that they are helpful for a follower of Jesus. That answer eluded me for a short time until the Lord revealed the reality of spiritual maturity to me through a friend and local minister. I realized that we can be mature in some areas and remain immature in others. I think we can see parallels to this in the physical realm as well. Someone can be mature in some areas of theology, and be immature in others, because they were never properly trained or discipled in those areas. This goes back to my earlier point about the church not doing a great job at teaching about the spiritual realm. We don’t know what we don’t know. Unfortunately, immature spiritual areas of our lives become very susceptible to deception from the enemy. It’s easy to be deceived when you don’t know better. And once you are in deception, you rarely know that it is happening. Spiritual immaturity can also lead to self-righteous attitudes forming in our hearts, that keep us from accepting the possibility that we have been tricked into believing a lie. For me, all of this comes down to a simple perspective. It’s not about theological positions of judgement vs. grace, legalism, or allowing believers the liberty to form their own doctrinal opinions; it’s about pursuing a lifestyle of holiness. Jesus taught us to “seek first the kingdom of God,” which means pursuing what he has for us above all else, and not looking to anyone or anything else to define our identity or provide us with spiritual experiences. We are called to be set apart, to be in the world but not of the world. We are called to pursue Jesus with everything we have. As we pursue Him, we grow in spiritual maturity. As we grow in spiritual maturity, we more easily recognize the “childish things” we shouldn’t allow into our lives. And as we set aside those things, we continue to reach greater levels of maturity. It’s a journey we are all on together, and we need to have grace for everyone as we grow through the different stages of our spiritual maturation process. Now here’s the secret to accelerate your spiritual growth: let Jesus be everything and every answer for you, and don’t let anything or anyone else ever take his place! The more I minister to people, the more I realize that there is a major need for good spiritual discernment within the body of Christ. We need to know if something we encounter is good or evil, if it is part of God’s plan or if something else is at work behind the scenes. There are so many different ideas and initiatives happening in our world today, and it’s easy to get sucked into the idea that something is good without realizing that it is actually rooted in evil. 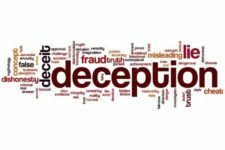 We have to be able to discern what is beneath the surface and ask God to reveal any attempt of deception or manipulation that a person, process, or system may be using against us in order to further its own initiative. Without Holy Spirit, this can be a difficult goal to achieve. The good news is that God knows the motives of everyone’s heart, and he has created a gift of discernment that is available to his children. That spiritual gift, listed in 1 Corinthians 12, helps us to quickly recognize anything that is not of God. When we use the gift of discernment in the systems of the world, Holy Spirit will guide us towards what he wants us to be involved in. We should be excited about bringing change to the world, and to individual lives, but it needs to be grounded in the phrase Jesus taught us to pray; “your kingdom come, your will be done, on earth as it is in heaven.” We need to be aware of what God’s heart is for any situation, focus on that, and set aside anything else that is contrary to what he wants to accomplish. Then we can pray for his will to be done, without being affected by all the other variables that others may try to mix into the situation. This method can be applied to anything. It can be applied to personal relationships, needed changes in culture, business development, something we recently learned but never heard of before, a message we heard at church, and any other area of our lives. All we have to do is set aside our own opinions and ask God for his heart for the situation. If we do this, we will have the guidance we need to make the correct choices and, at the same time, be able to avoid deception and manipulation. I hate deception and manipulation, it’s so evil. Anytime someone tries to deceptively control someone to do their will, it is essentially a form of witchcraft. I have fallen for this myself, not realizing that someone was manipulating me, or realizing it just a few moments too late, and I have used those situations to learn how to discern even more clearly. We need to be able to recognize the spirit behind something and recognize any perspective we have that might give someone an opportunity to manipulate us. Pray for discernment. Pray for wisdom. Know when to say no. And always love, even when someone is trying to manipulate you. One of the things I love about Jesus is that when you spend time with him, he reveals your true identity to you. Did you know that God has uniquely created each one of us with an incredible purpose and plan that we have the amazing opportunity to live out every day? Something I have discovered, and have come to believe strongly, is that we cannot fully step into what God has for our life if we don’t know who we are. I have also discovered that the enemy of our soul is constantly looking for a way to speak into our lives, so that he can keep us confused about our personality, our giftings, our identity, and the purpose for which we were created. Not knowing your true identity is one of the greatest issues in the church today, and the only place we can find that identity is in Jesus. No other method or system will ever be able to reveal the truth of our identity. It’s only found in Jesus. But sadly, so many followers of Jesus are searching for who they are in all the wrong places. A recent craze has infiltrated the church in the form of a spiritual personality test known as Enneagram that purports to help you with self-discovery, but what many people are not aware of is that it is based on Buddhist, Hindu, and other religious principles which have been twisted into something that “sounds” Christian and is actually nothing short of evil. It’s a practice that looks good on the surface, but just because something sounds spiritual, doesn’t mean it has come from God or is a good practice to incorporate into our lives. We have to get wisdom from God on what we should allow into our lives and discern what spirit is behind these types of practices. Again, our identity has to come from Jesus. It makes me wonder why people are willing to pursue an encounter with the “ancient Enneagram” instead of pursuing an encounter with the Ancient of Days. Why are we so uncomfortable with the Holy Spirit, but perfectly accepting of a strange mystical practice? Why are we pursuing other spiritual practices instead of delving deeper into God? If any believer is looking for their identity apart from Jesus, they are looking in the wrong place. And, even worse, if any believer is using a system, such as Enneagram, that is directly contrary to the word of God, they are openly inviting the demons behind that system to have authority in their life. Does that sound a little intense, or scary? It should! We are cautioned in 1 Cor. 10 that demonic forces are behind the other religions of the world. When God directed us not to follow after other gods, he did so because he knew those “other gods” were actually demons pretending to be gods. When someone searches for “truth” in any belief system other than Jesus, their search leads straight to a demon. There’s no way to sugarcoat it. It’s dangerous and can have serious consequences. Believe me, you don’t want to invite them to be a part of your life! Here’s the great news; don’t feel ashamed if you got sucked into the Enneagram craze. Just ask Jesus for forgiveness and renounce any partnership with Enneagram. If you are a leader that has encouraged others to use the Enneagram, you have a responsibility to make it right. Feel free to contact us if you need helping walking through this process. There are plenty of great non-spiritual personality and strength finding tests you can take, but when the personality test is based on religious beliefs that are contrary to God’s commands, you should steer clear of it. I was reading in a book this week about the importance of being content, and how being discontent can potentially lead us down the path of coveting what others have, or becoming jealous of the successes that we see in other people’s lives. It’s an interesting thing to think about because we all have needs that need to be met, and in some seasons, it takes longer to see those needs fulfilled, and that can easily lead to a place of discontentment. Hebrews 13:5-6 instructs us to be content with what we have because we can be confident that the Lord is our helper and will never leave us. If he promised something in his written word, through prophecy, or through a direct revelation to us, we can be sure that he will do what he said. Proverbs 13:12 tells us that hope deferred makes the heart sick, but if our hope is in Jesus, it is never deferred! We just have to change our perspective to hoping in his promises which are always fulfilled. We have so many prophetic words about what God is going to do in Washington D.C., and we would have loved to have seen all of them happen by now, but we now there is a perfect timing to his plan, so the best thing for us to do is be content where we are, and continue to wait on the Lord to fulfill his promises. If we go in the opposite direction, we risk the danger of falling into a trap of the enemy and believing a lie that we can’t accomplish our goals, fulfill our mission, or live out the purpose God has put within us. Paul talked about being content in every situation, and it’s a great reminder for all us. Be encouraged that God is on your side, that he has amazing plans for your life, and be content with where he has you right now. As long as we remain in his will, he will get us where we need to be in his perfect timing.